I can't speak of Venice without mentioning the masks. I took such a fancy to them that I started sketching all the models that seemed to have a significance. 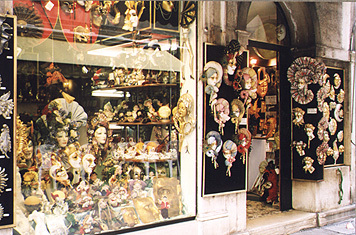 This started when we entered a mask shop near our Piazza San Stefano. We had all fallen in love with a great life-sized mask, brown-skinned, itself wearing a golden eye-mask, crowned with a mass of black feathers. But we had said: "Nah, we'll never be able to transport it." This time we said "To heck with the transport, we'll manage!" The shop had three such masks, two male and one female, and all three returned to Beirut with us, mine a birthday present from the two boys. 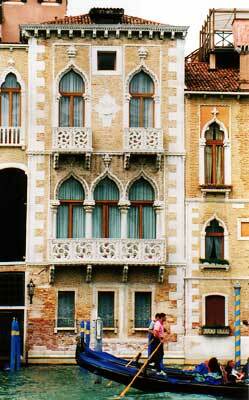 The young woman was very kind and showed us a gorgeous mask above the door, saying it was a Lady of Venice. That's where my survey frenzy started. The next day I came back to the shop with my sketches and with an enthusiasm that matched my own she explained each one to me (I was doubly delighted, as I was managing very well with my Italian). I give them here, but first I want to mention that the shop is in Salizzada San Samuele, a street parallel to the side of San Stefano facing the church. Bauta or Bautta or Casanova: This is the oldest, most typical Venitian mask. It used to be worn by people who didn't want to be recognized, among them the famous Casanova. It goes with the domino, a vast hooded mantle. Gatto (cat): Cats were so scarce in Venice that they became the subject of one of the most typical masks. 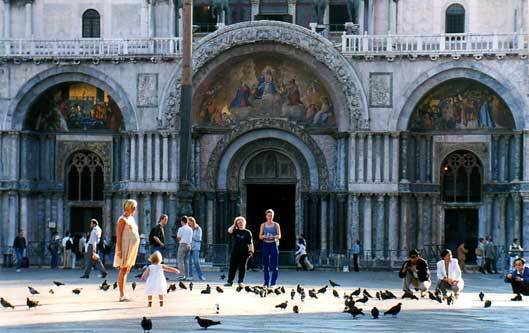 Legend has it that a man who owned nothing but his old cat came to venice from China. The cat rid the palace of all its mice and the man became rich. When he went back home, his rich neighbour was green with envy and rushed to Venice with his most precious silks, thinking that if a mere cat made the other man rich, he would be enormously rewarded for these precious items. Indeed, the Duke promised him his most precious possession in return for his gifts... and the neighbour went home with the cat! Dama di Venezia (Venitian lady): This mask, which presents many elegant variations, corresponds to the ladies of the Cinquecento (the period of Titian) who covered themselves in jewels, expensive clothing and elaborate coiffes. Medico della peste (plague physician): The medico della peste used to protect himself with a mask with an elongated beak, which was stuffed with medication-soaked linen. 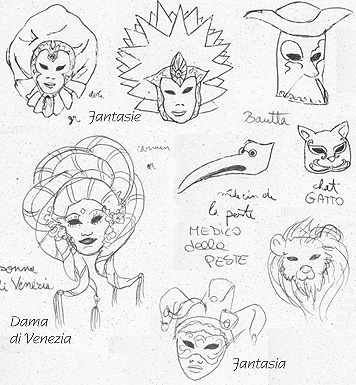 Fantasia: These masks are, as their name indicates, fantasies, directly born of the imagination of maskmakers. Lion: The ubiquitous totem of Venice! 1. The artisan fashions the desired shape in clay, then makes a plaster imprint of it that will serve as a mold. 2. Papier mâché is prepared out of paper, rags and a special kind of glue. 3. The mold is coated with papier mâché. 4. The surface is polished with an abrasive, then covered with one coat of a white mix. 5. The eyes are cut out, and last details are polished off. 6. The mask is painted, and other accessories such as feathers added. 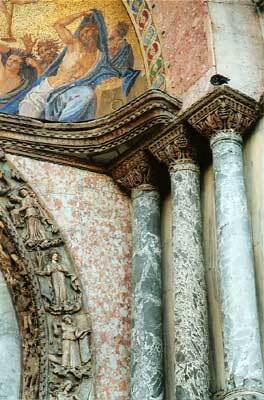 We were back in San Marco in the morning, and this time we paid more attention to the basilica itself. 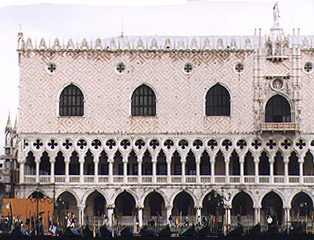 It was the Doge's chapel, used for civil and religious ceremonies that were part of the political life of the Republic, such as the proclamation of the Doge; it is therefore a part of the group of buildings of the Doge's palace, to which it forms a magnificent and quite dominating appendix. 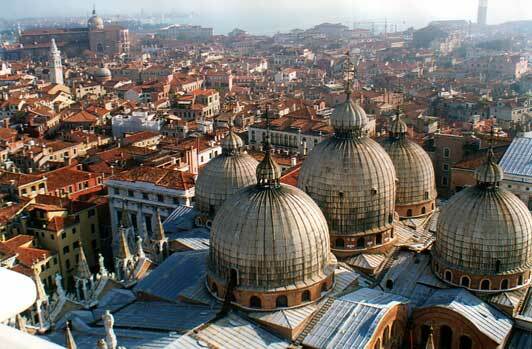 It is now since 1807 the see of the Patriarch of Venice. No need to point out that it is quite a unique building, with its Greek-cross plan, domed in Byzantine fashion, with bulbed dome of Oriental inspiration, French ogive arches etc, its interest further enhanced by the rich mosaic decoration, beautifully wedded combination to the marble columns. 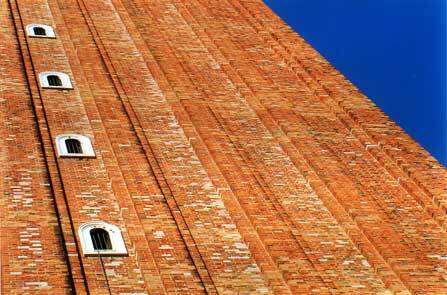 We climbed to the top of the Campanile, the titanesque belltower facing the basilica's left corner. Not on foot, because the top is only accessible by elevator. It is 99 meters high and the view is beyond words. The entire city is visible, in series of wondrous rooftops and isles. The basilica itself looks as if it had been designed to look good from the sky as well as from the ground, which is very unusual! The Campanile actually collapsed in 1902, but the only victim was a cat, even though it was 10 am: obviously, this was never a city of early risers. It was then rebuilt stone by stone, as was the little room at its foot, a jewel of the High Renaissance. The marangona rings the beginning and end of a work-day. The nona was the noon bell. 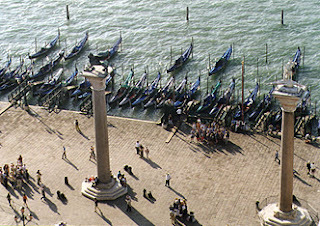 The mezza terz convoked the senators to the Doge's Palace. The trottiera signalled that a new session of the Grand Council was starting. 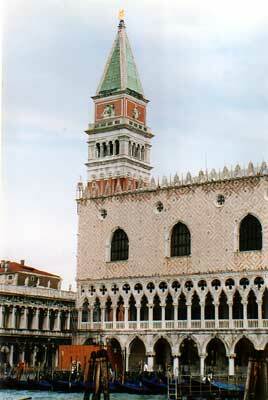 The Palazzo Ducale or Doge's Palace is just as unusual as the basilica. It was built in the 9th century, in the form of a mighty castle. Afterwards it was enlarged and rebuilt several times. 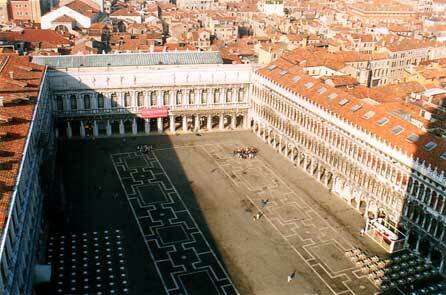 It revives the Greco-Roman tradition of an open square (the courtyard) surrounded by a portico. Seen from the outside, its imposing volume evades bulkiness through an ingenious device, an inversion of masses: the full volumes are placed at the superior levels while the inferior galleries have finesse of decoration that enhances the lightness of the whole. The prisons of the Palace gave me shivers, even though they're now so clean and tidy they rather look like a stage set for a Casanova movie. 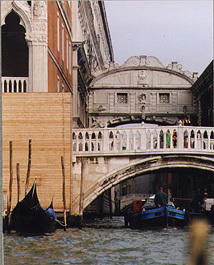 It is said that he was imprisoned there, and that he passed by the Bridge of Sighs when he made his miraculous escape. This baroque bridge, the Ponto degli Sospiri, was thus named because it leads to the prisons, and prisoners on their way to the cell where they would spend the rest of their lives would sigh abundantly on their way. I'm not sure what turned this sinister feature into the romantic bridge it's considered to be today. Facing the Palazzo across the water the church of Santa Maria delle Salute, dedicated to the Blessed Virgin of the Salute, as thanksgiving for delivery from the 1630 plague. 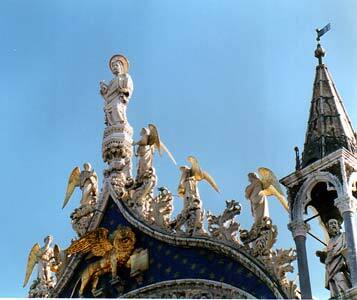 It is built in an octagonal shape to evoke a crown to the Virgin. We visited and continued our tour, planning to go all around to rejoin our "residence" area on foot, visiting on our way several recommended monuments. We passed the Scuola Grande of San Rocco, because painting did not very much interest us then. We stopped a bit longer at Santa Maria Gloriosa dei Frari, a Gothic church with a beautifully intricate exterior. Unfortunately I was wearing shorts, something forbidden in Italian churches, and so I opted for staying outside. A few months later I had to present an analysis and a paper about an altarpiece hanging in that church, which turned out to be one of the most important churches of Venice, and the one in which Titian was buried after having painted all its altarpieces! AAARGH! 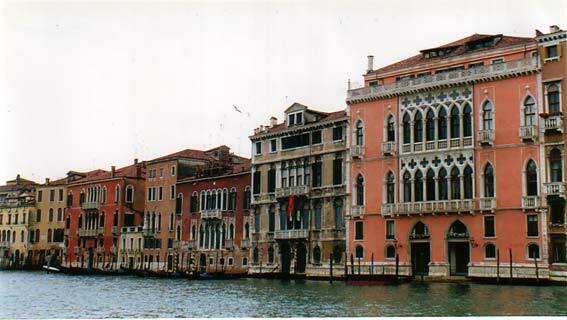 The city is built on water so there is no dry land for a central open court, and because palaces are on the Grand Canale, the ground floor is uninhabitable (occasional flooding). Moreover, the Republic enjoyed economic and political stability so there was no need to fortify palaces or to make room for a central well (essential during a siege). Therefore the typical Venetian palace type is a single block, presenting large openings at the water level with stairs running out of entrance hall, and the rest of the floor taken up by store-rooms. The piano nobile (first floor, inhabited by the family -- the last floor was for servants) is much more important than in any other Italian examples, and we see here the further characteristic to divide the facade in 3 vertical elements; the main room is the Gran Salone, occupying all the center of the facade, with smaller rooms at either side expressed on the facade by smaller windows. Because the Gran Salone is only lit by the front and back (since there are neither side-windows nor court), its windows must be as large as possible because it, hence the most characteristic feature, the great mass of window openings in the centre of the facade. Venetian conservatism kept this type unchanged from the 15thc to the 18thc, with as only modification the systematizing of the facade into a symmetrical disposition with regular openings and ABBA or ABBBA rhythms. It was with great excitement that I awoke in Venice to my 19th birthday! 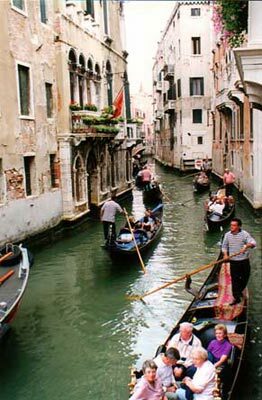 I had planned long ago to have a gondola trip on that day, and Mounya, Fawzi and I set off in the early morning to San Marco (once again) to catch one before tourists came pouring in. We still had to wait a bit, because gondoliers are not crazy enough to start at dawn... We quietly sat down on the piazzetta for a while, at the foot of one of the columns. 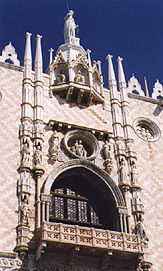 The two columns of the Piazzetta, which frame it most extraordinarily for viewers coming from the sea, each bear a protector of the Republic: St Theodore triumphing over the Dragon (the original statue is now in the Doge's Palace), and the Leone Marciano holding the scroll bearing the city's motto. Pax tibi, Marce, evangelista meus. Hic requiescet corpus tuum. ("Peace be on thee, Mark, my Evangelist. Here shall thy body be lain to rest"). 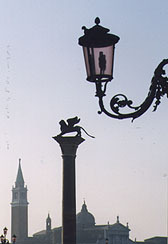 This has become the motto of Venice, and Marks' Lion its symbol. We saw a number of representations of the Lion in the Palazzo Ducale: in all these paintings, as well as on the Republic's banner, the Lion is represented with its front paws on the dry ground and the rear ones on the water, to show the "amphibious" nature of the Republic. The red and gold, colours of the banner, are also the colours of Byzantium, another expression of how undissociable Venice is from its roots. The gondola is an important part of the Venetian scene, the product of an ancient art improved on through the centuries to create an object which is perfect both aesthetically and functionally. Its lightness, shallow draught, minimum resistance to water, great manoeuvrability and remarkable carrying capacity are linked to the topographical needs of the city. 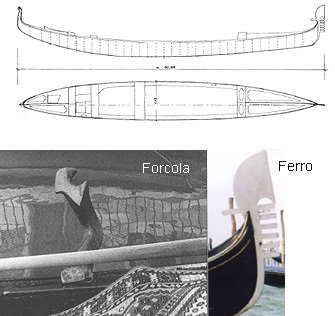 Intended to be rowed by a single oar, it is asymmetric to balance the side thrust of the oar and balance the weight of the gondolier. It has an elegant shape, pure of line, with numerous interesting details like the ferro on the prow and the forcola, a row-lock of walnut wood carved like a piece of sculpture. The horizontal bars on the ferro represent the six sestieri (quarters) of Venice placed under the authority of the Doge: Cannaregio, San Marco, Castello, Dorsoduro, San Polo and Santa Croce. We haven't seen a car in three days... Heavenly! But our stay in Venice draws to its close. A bit melancholy from having to leave, we walk randomly in the area of the Rialto, before embarking again on the adventure of taking our (now even heavier) luggage back through the stairs, court and vaporetto to the railway station... A picnic on the stairs facing the Grand Canale, and it's Farewell to Venice... On to Sienna!